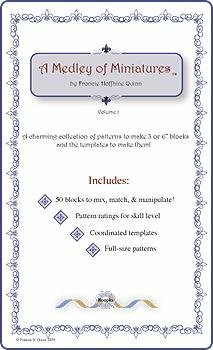 Medley of Miniatures by Froncie Quinn, is a little inspirational book of 3" blocks that can coordinate with the 3" Posey Packets© to make charming sampler quilts (imagine all the possibilities!). Enlarge the blocks to 6", 9", 12" or ANY size you want! Fifty blocks are shown and the templates to make them. Instructions are general only. Make your own shapes from the printed patterns or use the Template Bank Stencil for extra ease.